If your Tyler, TX home or business has experienced water damage, call our SERVPRO of Tyler team today. To avoid secondary damages to your home or business, it is crucial to call our SERVPRO team as quickly as possible. Our SERVPRO of Tyler Storm Team ready for a busy day! Our team knows that severe weather doesn't damage your Bullard, TX home at a good time. Our team is always available, day or night, to come to your aid. When disaster strikes your residential or commercial property in Bullard, TX, SERVPRO of Tyler is ready to help! Our team prides ourselves in being "Faster to any size disaster" and you can count on our team to get your property back to preloss conditions. Our SERVPRO of Tyler team is getting ready to head out for a busy day. Recent storms have caused damage to several homes in the Tyler, TX, area. If severe weather damages your home or business, give SERVPRO of Tyler a call. Check out these storm damage tips and what you can do until our team arrives. 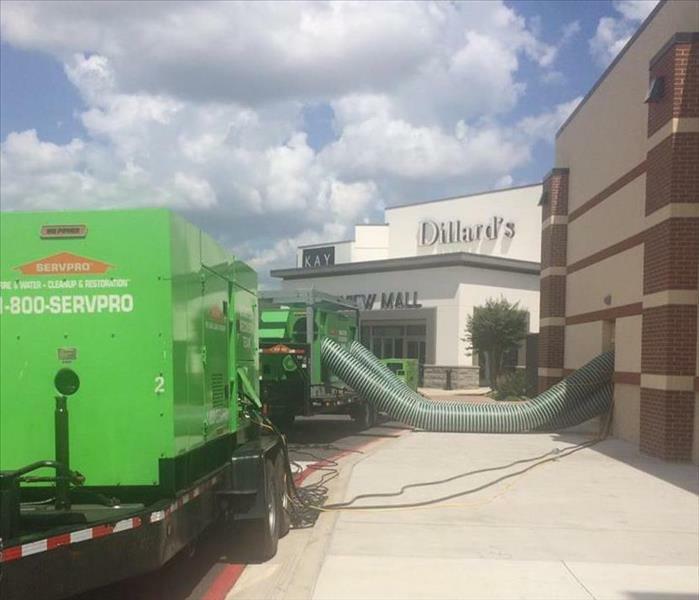 Our SERVPRO of Tyler team is currently in action extracting water after a commercial water loss in Tyler, TX. 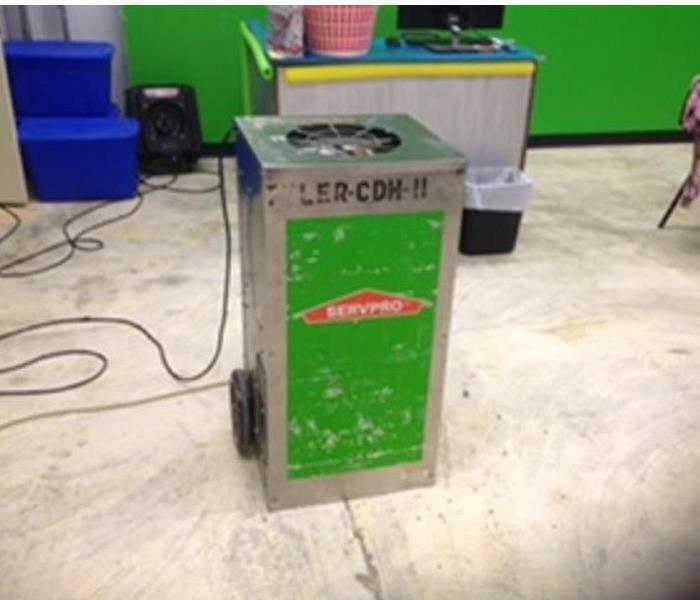 After extraction, our SERVPRO of Tyler team will remove damaged materials and set up the drying equipment. If unexpected flooding occurs and severely damages your commercial property in Tyler, TX, give SERVPRO of Tyler a call right away. The longer the damage is left untreated, the bigger the chances for mold and further damage to your property. Give us a call! Spotted our SERVPRO vehicles on the roads? Have you seen our green SERVPRO vehicles out on the roads yet? Our team is always out and about responding to various types and sizes of losses. SERVPRO of Tyler is available to respond 24/7/365, so if disaster strikes, don't hesitate and give us a call! 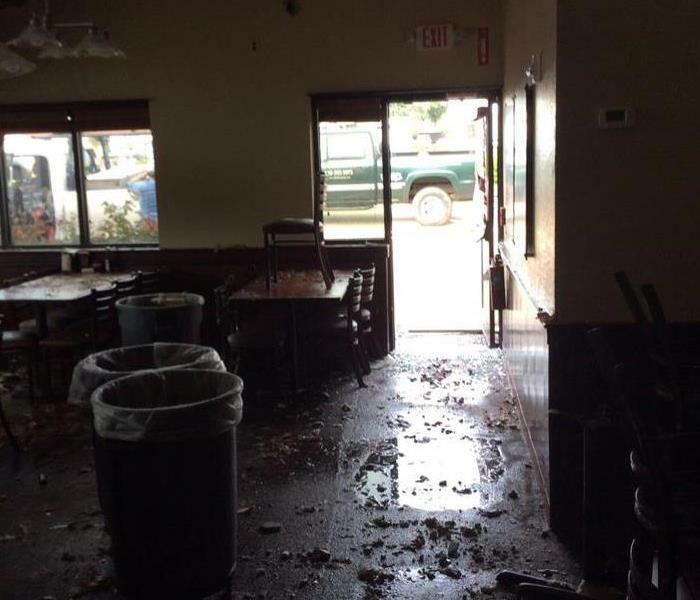 Our SERVPRO of Tyler team recently responded to a severe commercial water loss. Our team quickly got to work to get this facility back to normal. If you experience severe water damage to your commercial facility, it is important to know where to turn. Our team has the expertise and equipment to handle ANY size loss. Our SERVPRO of Tyler team is always on standby and available to respond. If you experience a loss in your home or business, our Tyler team can quickly respond and get to work to make your damage "Like it never even happened." 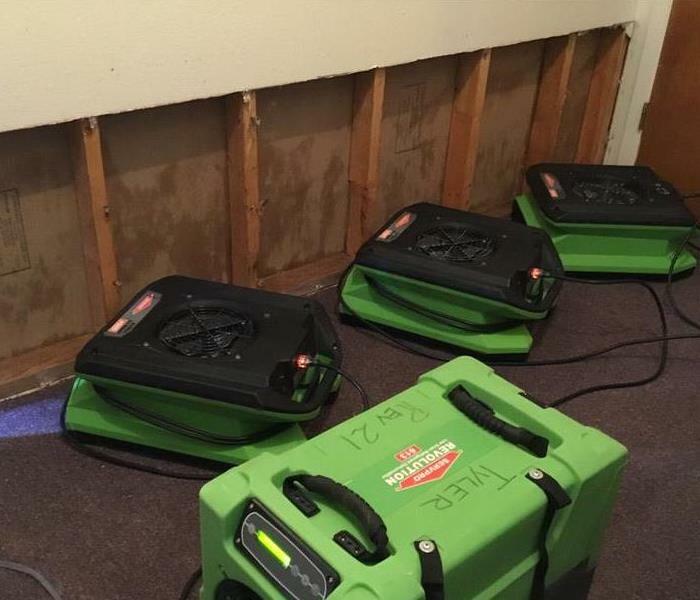 After a severe commercial water loss, our SERVPRO of Tyler team was called to action. 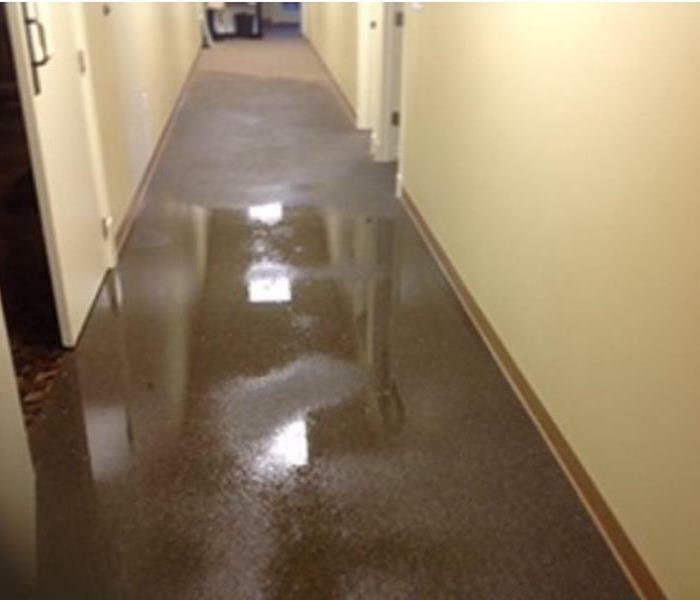 Our team quickly responded and began working to make this commercial water damage "Like it never even happened." The drying equipment is up and running after a large commercial water loss. No size water loss is too large for our SERVPRO of Tyler team to handle. If you experience a water loss on your commercial property, call our SERVPRO of Tyler team! 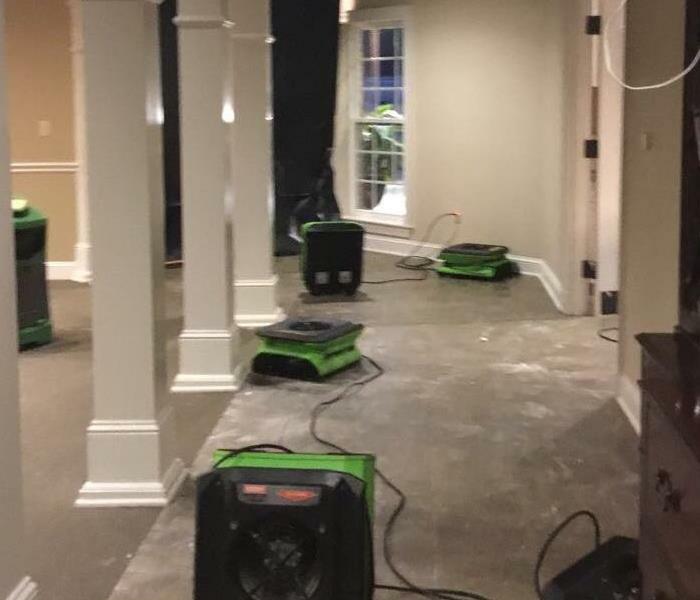 Commercial water damage restoration and cleanup is only one of many services our SERVPRO of Tyler team offers. Our team is on standby 24/7/365 and ready to respond to ANY size commercial loss. Give us a call! 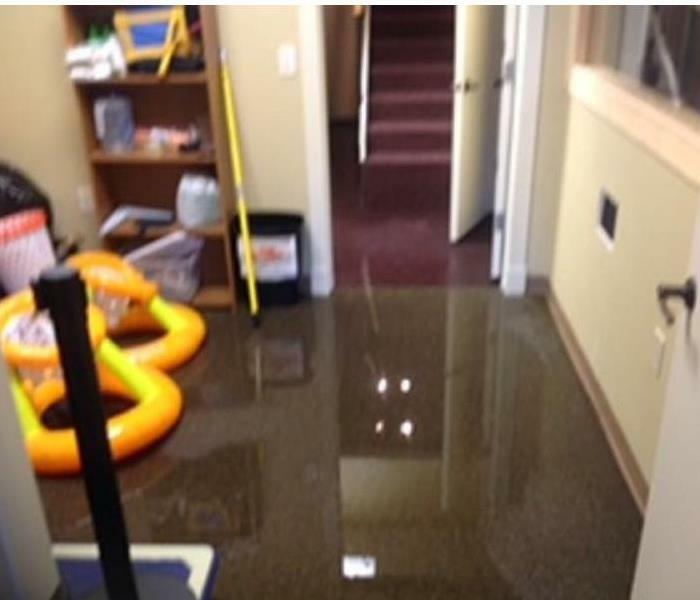 After a commercial water loss, our SERVPRO of Tyler team was called and quickly got to work. 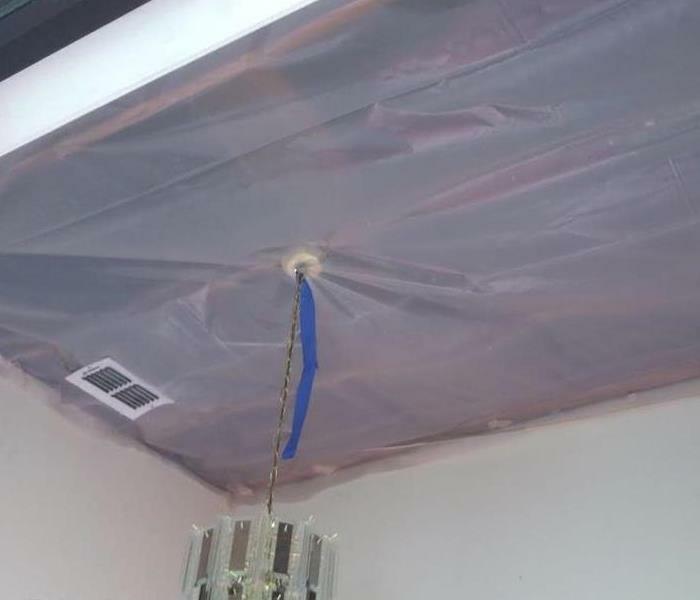 Time is of the essence when it comes to water damage, and it is important to call a certified restorations team as quickly as possible to minimize the damage. If you experience a water loss in your home or business, give our SERVPRO of Tyler team a call! Disasters always occur at the most inconvenient time. Our SERVPRO of Tyler team prides ourselves in always being ready to respond. Our team is always on standby and ready to help, 24 hours a day, 7 days a week, 365 days a year. After getting a call that a homeowner in Tyler, TX, discovered mold in their home, we quickly responded. Mold can be very harmful and potentially cause serious health effects. If you see signs of mold, do not hesitate, call SERVPRO of Tyler. Our SERVPRO of Tyler team received a call from a homeowner in Tyler, TX, after a small fire damaged the kitchen. Our team quickly responded to start the fire damage restoration and cleanup. When disaster strikes, our SERVPRO or Tyler team is Here to Help. 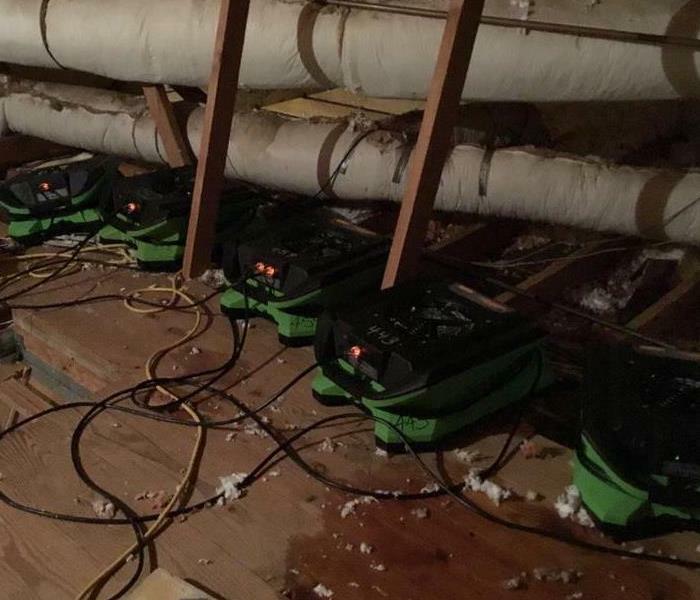 After our SERVPRO of Tyler team received a call about water damage in a commercial attic, we quickly responded. 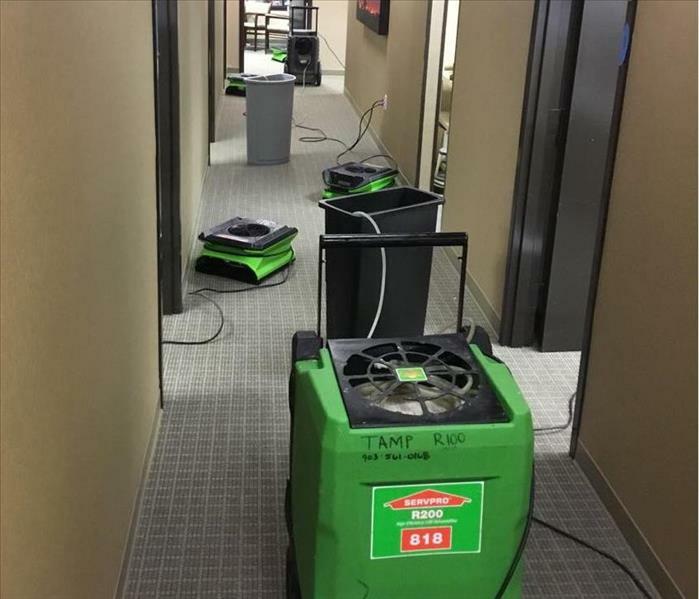 Commercial water damage restoration and cleanup is no problem for our SERVPRO team. Give us a call. 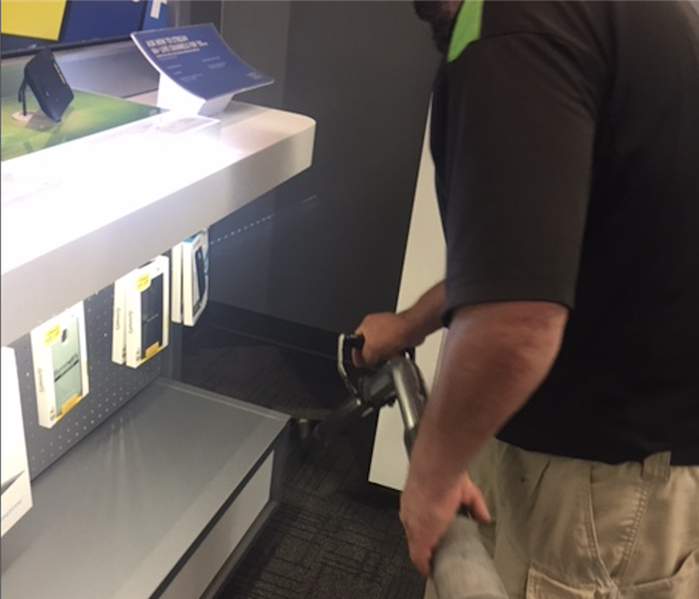 If your home or business suffers damage from a water loss, our team is here to help. We are available 24 hours a day, 7 days a week to respond to your disaster. Just give us a call. 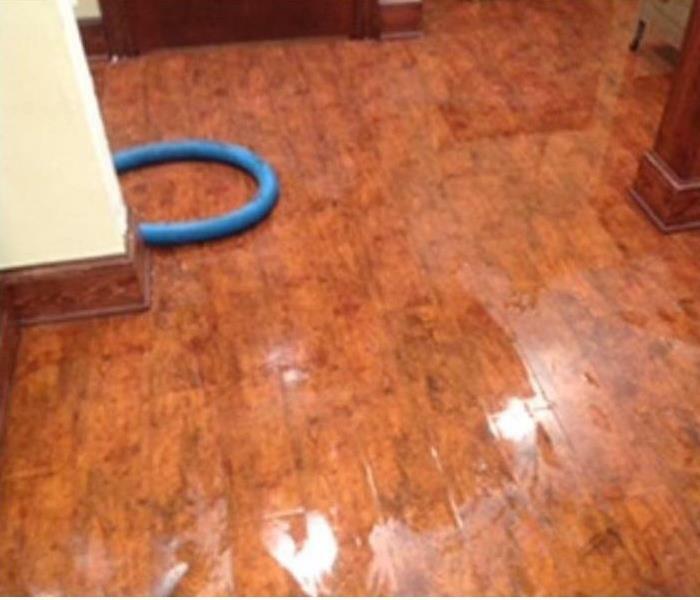 The rug and the hardwood floor in this image were soaked after a water loss from a broken pipe. Our team arrived quickly and got to work immediately on extracting the water and repairing the damage. 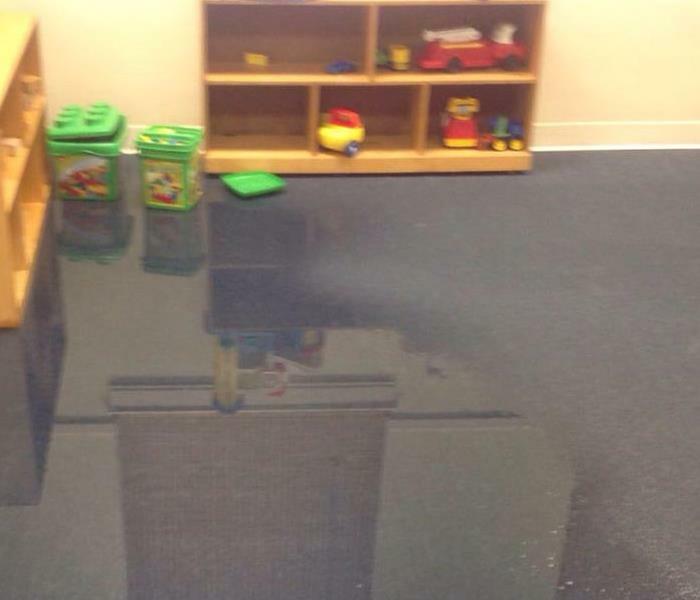 There was still a lot of standing water in the floor when we arrived at this facility, as you can see from the image. 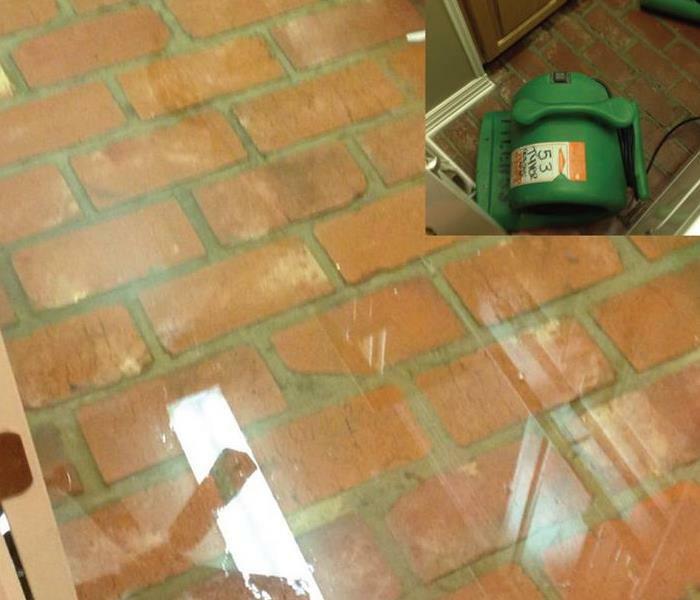 If your home or business suffers a water loss like this, call SERVPRO. When dealing with a water loss, it is important to dry the moisture as quickly as possible due to the fact that secondary damage such as mold can begin to develop within 24 to 48 hours. When your home or business experiences a water loss, it is extremely important to dry the moisture quickly because if it is left for more than 24 hours, secondary damage such as mold can begin to develop. 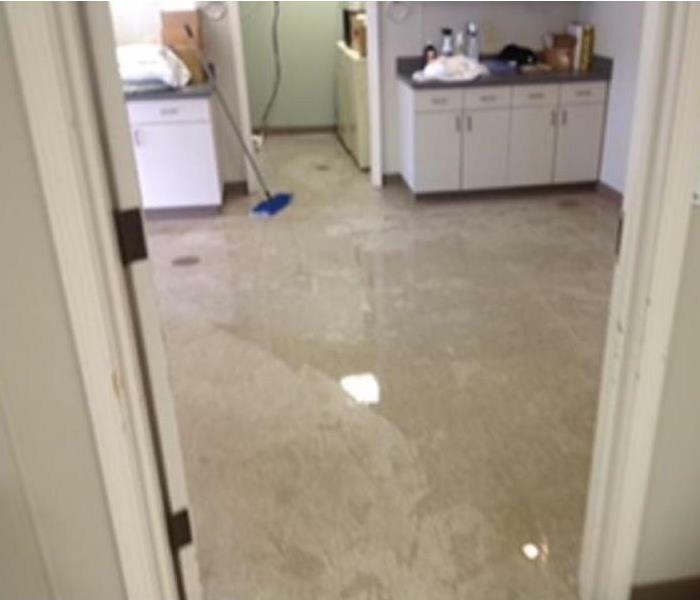 The facility pictured here was left flooded by a water loss and our team was brought in to clean up and repair the damage. In this image, you can see some of the equipment we brought in to help with the drying process. 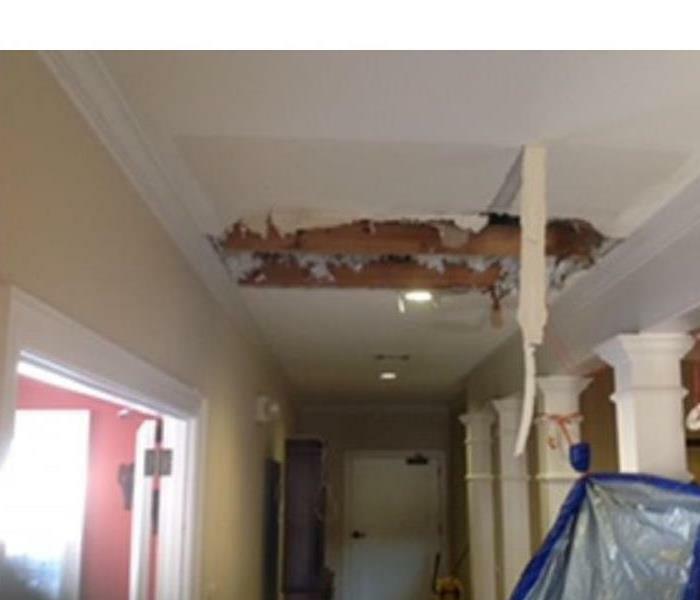 The ceiling in this image was damaged by water from a broken pipe. When we arrived, we removed the damaged material and got the moisture issue addressed quickly. 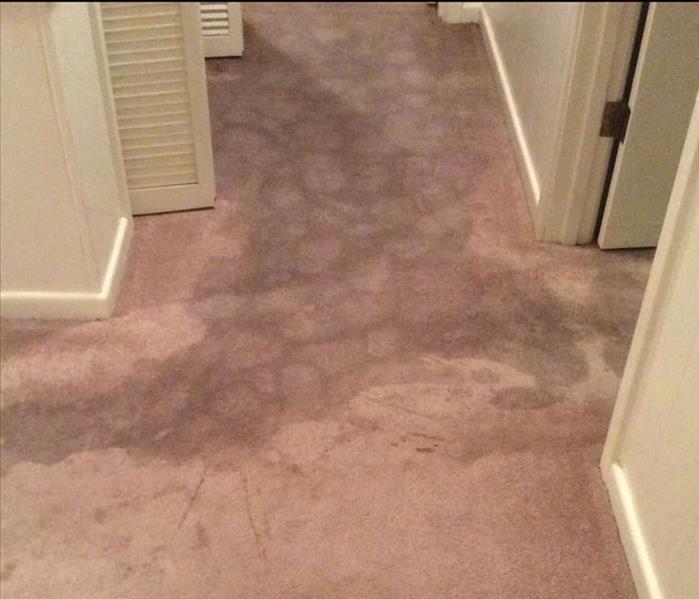 If you have a water loss like this, call us. Our team was brought in to repair the damage to this home after it suffered from a water loss. As you can see, there was still water in the floor when we arrived. If you have a water loss, call us! The ceiling pictured here was damaged by a water loss from a pipe leak upstairs. We were able to get the damage repaired and the home dried quickly. If your home suffers a water loss, give us a call. This structure suffered a water loss that left parts of the building flooded, as you can see from the water left in the hallway in this image. Our team was called in to handle the cleanup and repair. In this image, you can some of the equipment we use for helping to speed up the drying process after a water loss. If your home suffers a loss like this, give us a call. 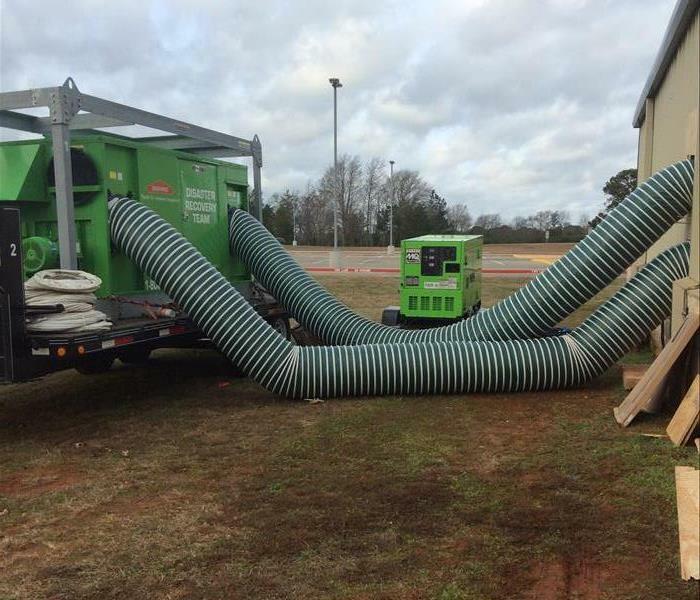 This facility suffered a water loss and the crew of SERVPRO of Tyler was called in to handle the cleanup and repair of the facility after the disaster. In this image, you can see some of our drying equipment onsite. 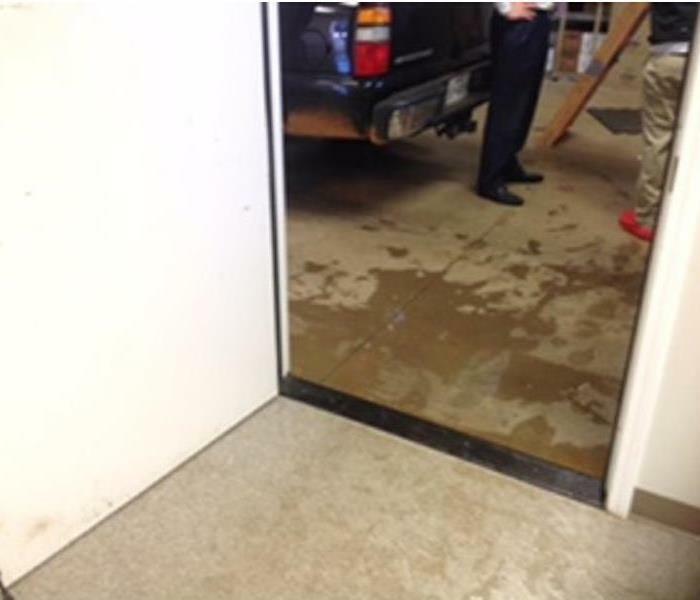 If your home or commercial property is damaged by water like the one pictured here, SERVPRO of Tyler is here to help. We are available 24 hours a day, 7 days a week to take your call. 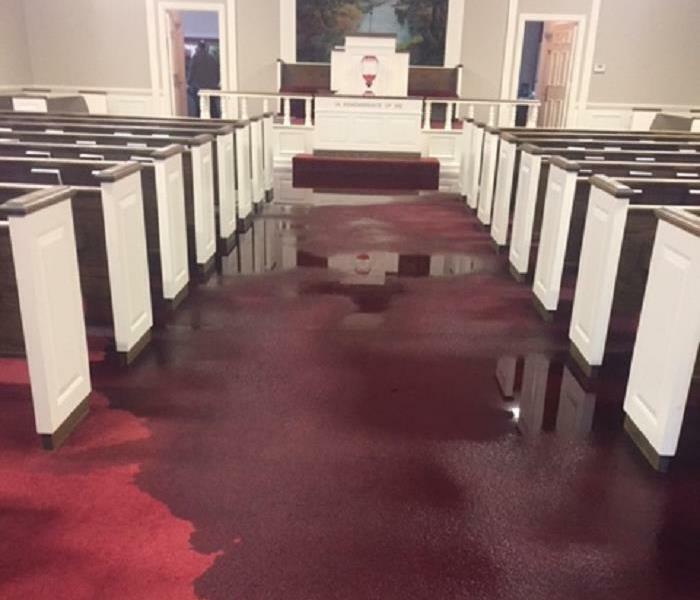 A broken pipe flooded the chapel of this church. It was a big mess that needed a lot of special attention from our technicians. SERVPRO of Tyler was glad to be of service to cleanup the broken pipe. 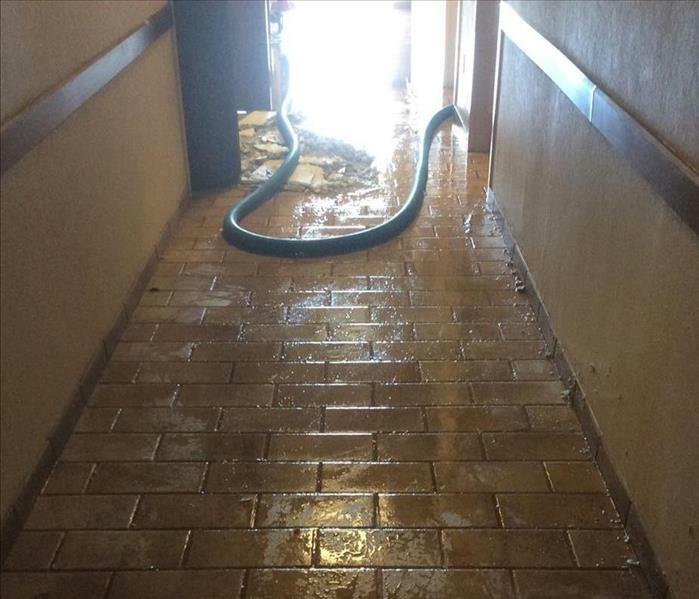 SERVPRO was called to respond to this large commercial water loss. Our team quickly extracted all of the water and got drying equipment in place to get the facility dry. 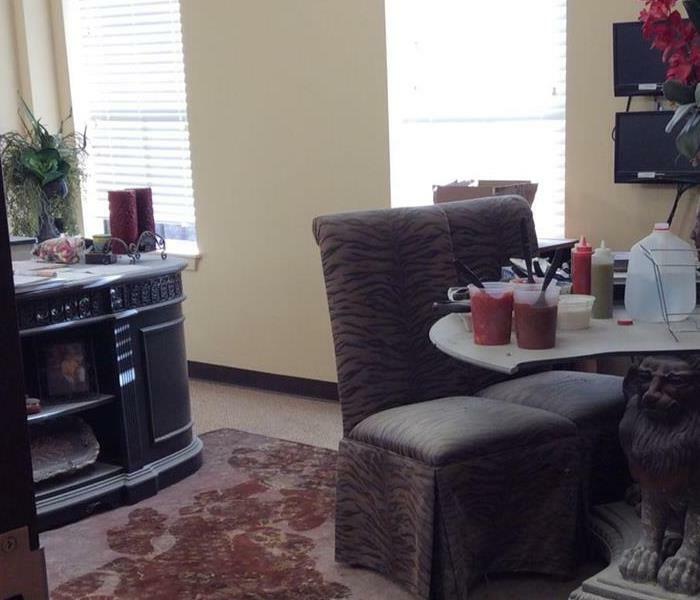 If you have any questions about our commercial restoration process, feel free to contact us at anytime. This is the aftermath of a water loss in Tyler TX. There was water damage over the entire floor. 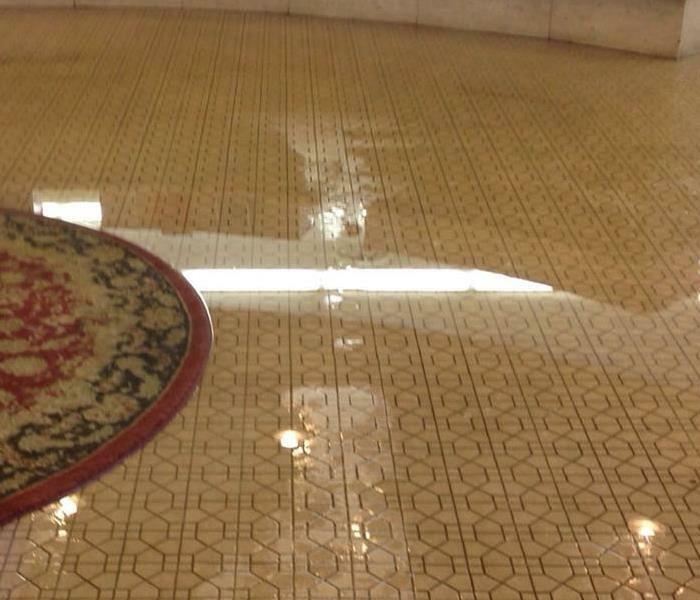 The team was able to remove the water and tear up the floors. The air movers are used during the drying process. This is the after of a water loss. The floor was saturated with water. The team at SERVPRO quickly extracted the water and is using the air movers to dry the area after removing drywall. This facility had a lot of water damage that needed to be cleaned up. SERVPRO of Tyler was quick to get on site and begin the water cleanup process. If you have any questions about our team, feel free to reach out at anytime. 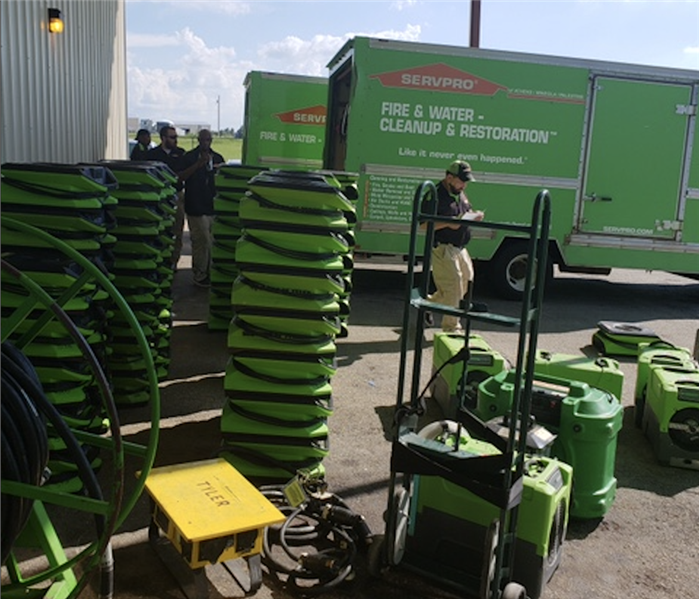 SERVPRO of Tyler was quick to respond with relief efforts in Houston, TX after Hurricane Harvey. Most of the work was caused by flood damage. Since the water came from the outside, many of the materials that were affected had to be cut and removed. It is important to get affected materials removed and adequate air flow in place immediately to prevent secondary damages. Hurricane Harvey left a lot of damage in Houston, TX. SERVPRO of Tyler was quick to respond and help businesses and homeowners in the Houston area. Most of the damages were caused by severe flooding. After a water damage in this home water drained in to the crawlspace and affected the homes structure and foundation. 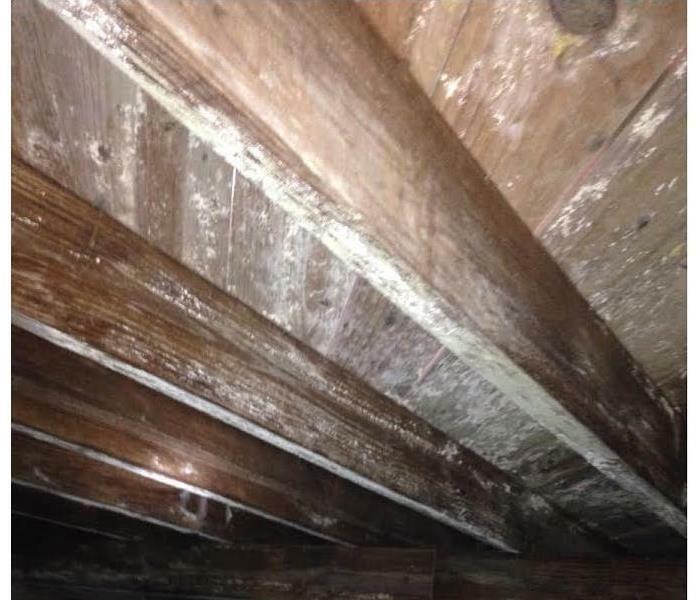 Thankfully they called SERVPRO of Tyler and we were able to help them dry and restore the crawlspace. The homeowners were grateful that our 24/7 services were available and the foundation of their home is dry and structurally sound. 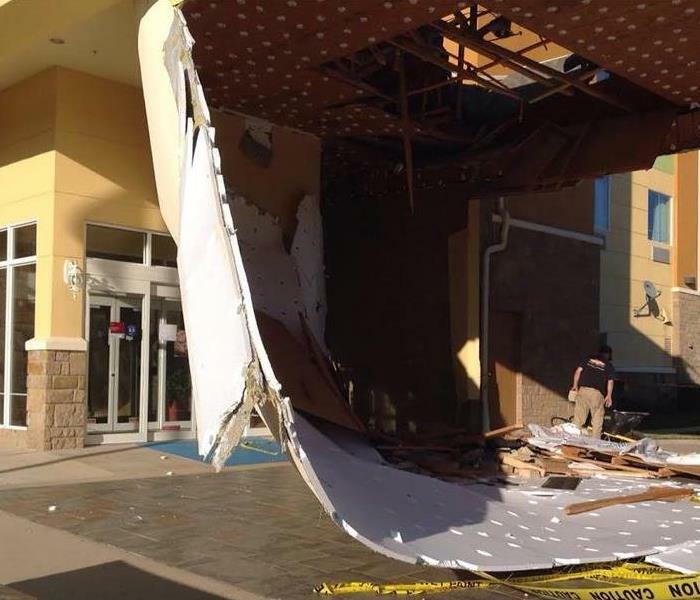 A department store suffered serious damage after storm water flooded the building. Thankfully they called SERVPRO of Tyler and we were able to help them and several others clean up and restore their property. SERVPRO worked with the store staff to keep the store open during the restoration process. If your home or business has experienced water damage, call us right away at 903-561-0168. Disaster can strike when we least expect it, but SERVPRO of Tyler will be there to help you weather the storm. This preschool suffered damage after a fire. Thankfully they called SERVPRO of Tyler and we were able to help them restore their property. This fire happened on a Friday on a holiday weekend. The building owners were grateful that our 24/7 services were available to them in their time of need. 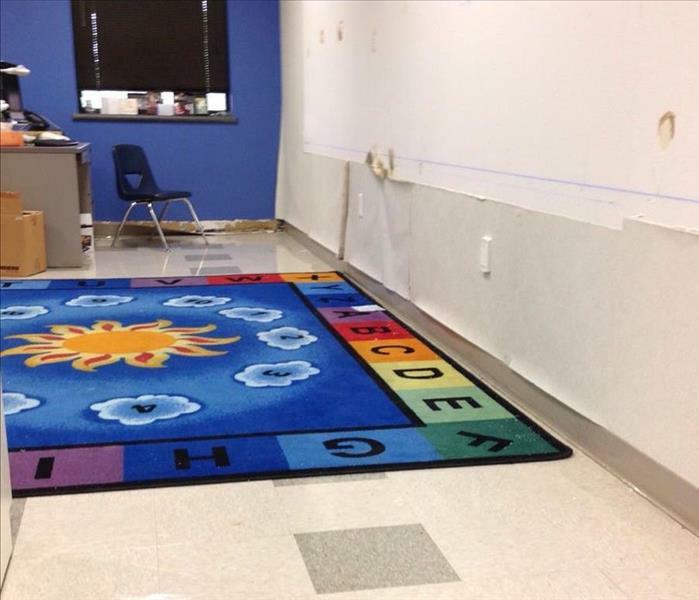 SERVPRO professionals worked through the weekend to restore the classrooms and offices. The director was happy restoration was complete in time to reopen the next week. 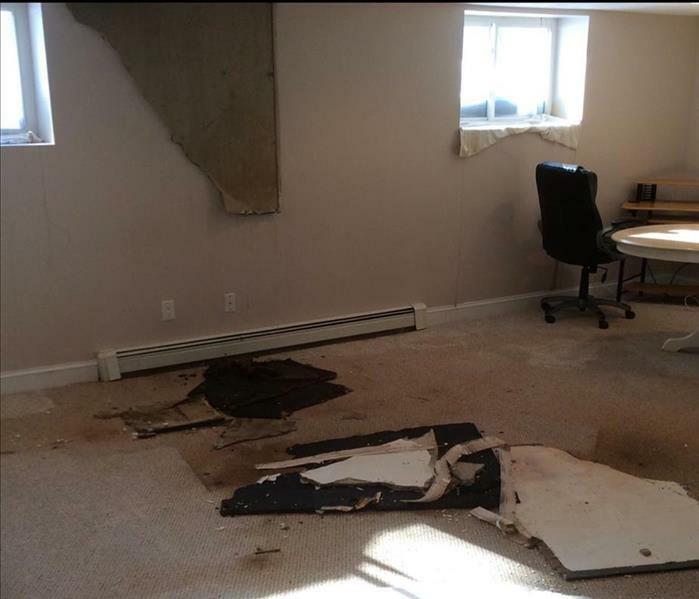 This office building suffered serious damage after a pipe burst. Thankfully they called SERVPRO of Tyler and we were able to help them and several others clean up and restore their property. The building owners were grateful that our 24/7 services were available to them in their time of need. A spring storm caused flash flooding that ripped through a Lindale home. The home owner was out of town at the time. When she arrived home she found her home was affected by mold growth. SERVPRO of Tyler came in to help. 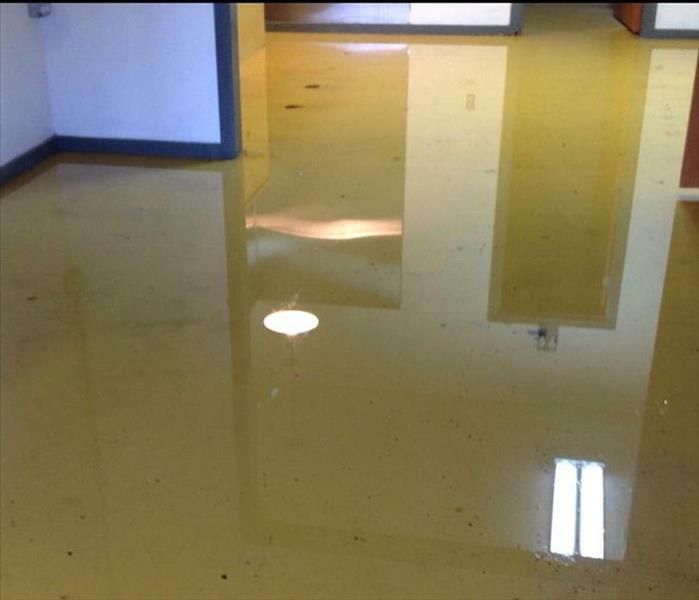 After a long holiday weekend an elementary school principal found part of the campus flooded. SERVPRO of Tyler quickly extracted the water and started the drying process. A few days later the school was able to reopen the affected classrooms and resume classes as usual. 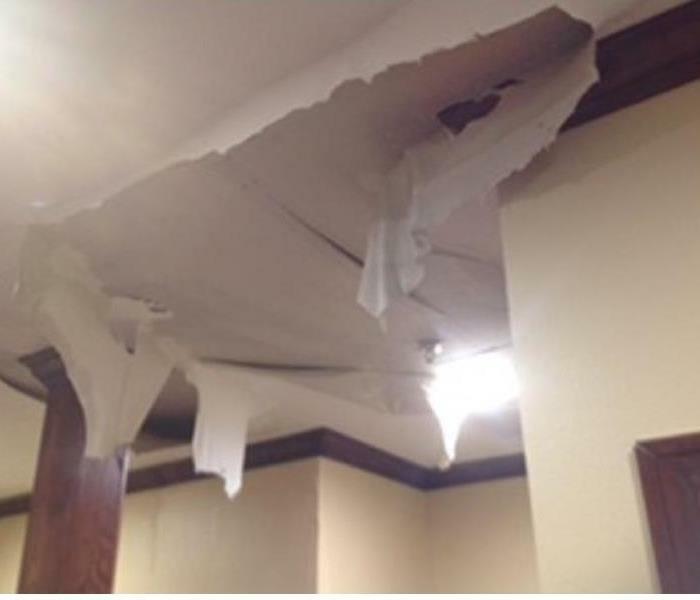 When water damage strikes call SERVPRO of Tyler at 903-561-0168. This customer had a previous water damage. The customer did not feel the structure was dried properly. The water damage had affected the subfloor. The customer looked in his crawl space and noticed white growth on the subfloor. The customer called the SERVPRO of Tyler team to help. After inspection, we found growth to be affecting the entire crawl space. 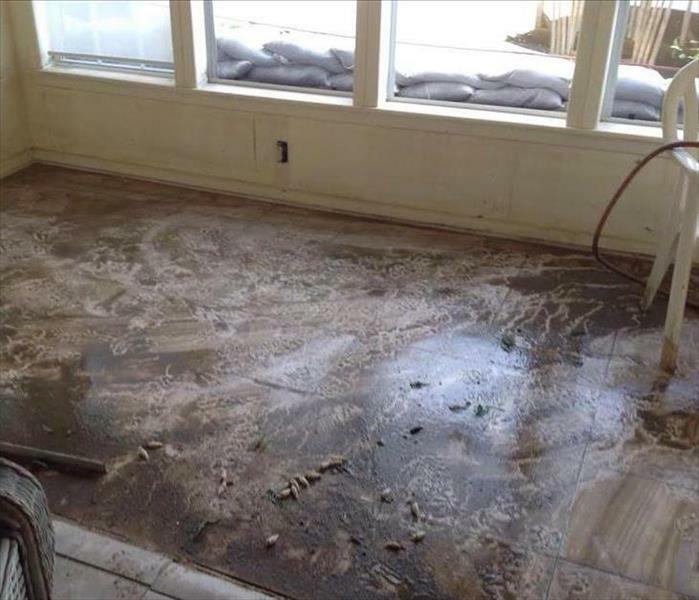 Our crew determined that instead of replacing the subfloor, that we would be able to clean the affected areas. The crew cleaned, HEPA vacuumed, and treated with anti-microbial throughout the crawlspace. Call SERVPRO of Tyler team to inspect a water damage to limit the possibility of mold growth. Customer had loss that came from the dryer catching on fire. 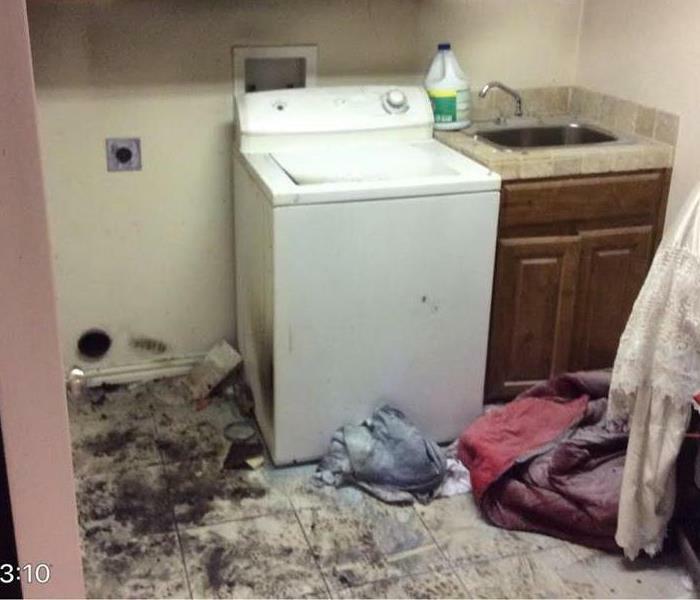 The customer’s wife put the fire out and drug the dryer outside so that the smell wouldn’t remain in the home anymore. Smoke and soot from the fire affected the whole house due to the HVAC system running at the time. The soot build up was cleaned by the fire crew in eight rooms, along with some mattresses that had retained the smell of the smoke. We also deodorized the structure with a hot thermal-fog to get rid of the smell of the smoke. The customer was satisfied with services and was happy to be able to live in a smell-free home. 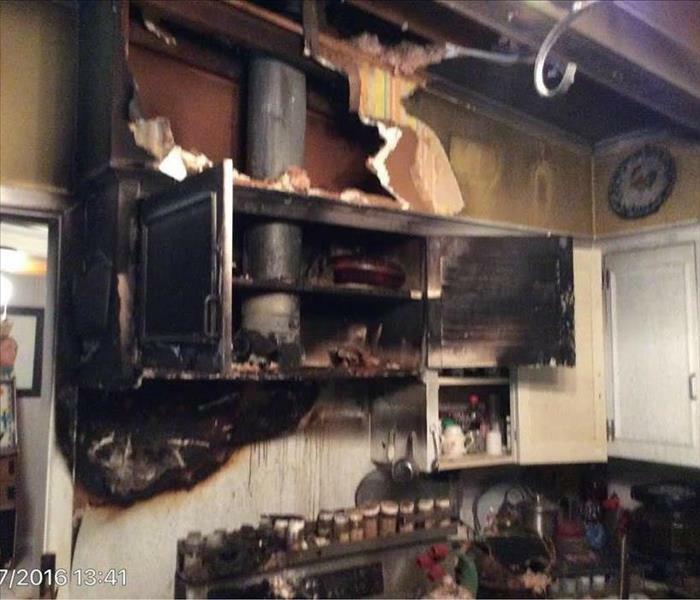 Customer had fire loss occur at the kitchen stove while cooking dinner. Grease caught fire on a burner and began a grease fire. The HVAC system was running at the time of the fire, so smoke and soot carried through the home to the other rooms, affecting textiles, furniture and many collectible contents as well. After inspecting the home, our team was able to complete a pack-out of the customer’s contents and clean the structure from top to bottom. The customer was able to have contractors in the home to rebuild the kitchen after our crews were complete with restoration. A Church had a roof leak that happened about nine months ago, and growth began to present itself in the foyer and small areas of drywall in the church. 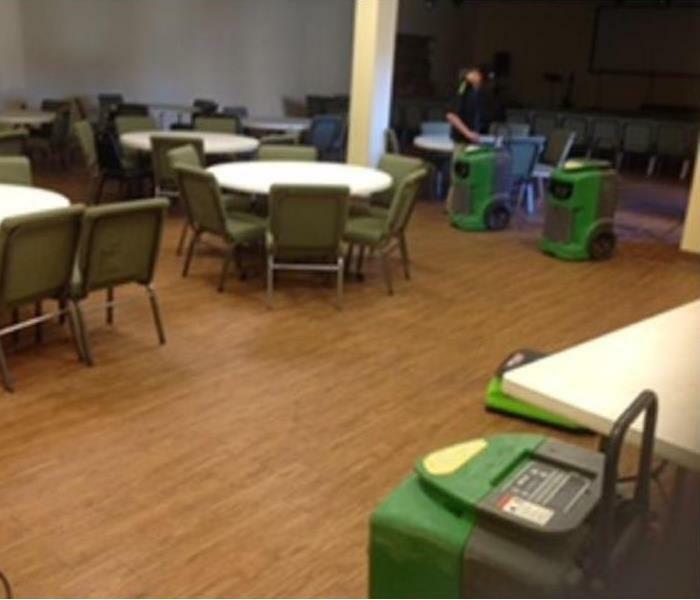 SERVPRO of Tyler was able to help prepared the church for contractors. The church was able to resume its services with minimal interruption and construction needed to the area. Customer had a leak behind a shower that had been continuously leaking for a few weeks. Growth began to appear in a small area close to the source of the leak. The growth then spread up about two feet and throughout the studs of the wall. 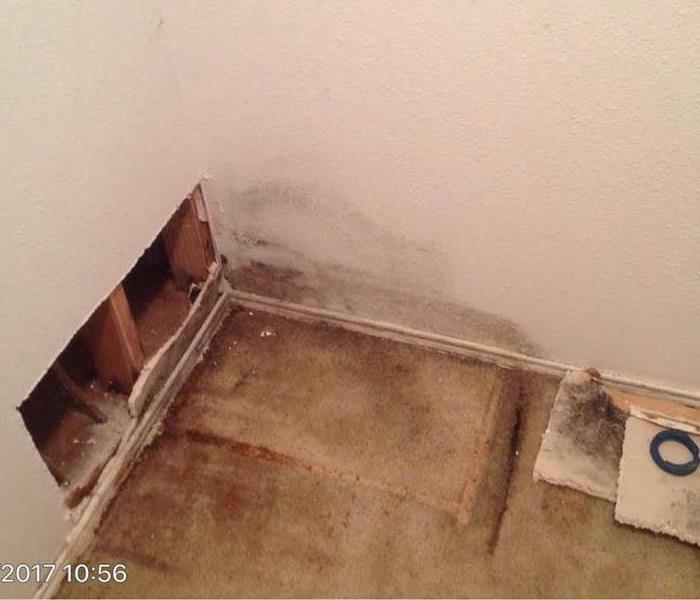 After inspecting the job, the crew decided that it would be best to complete a two-foot flood cut throughout the closet and remove the affected carpet and pad. 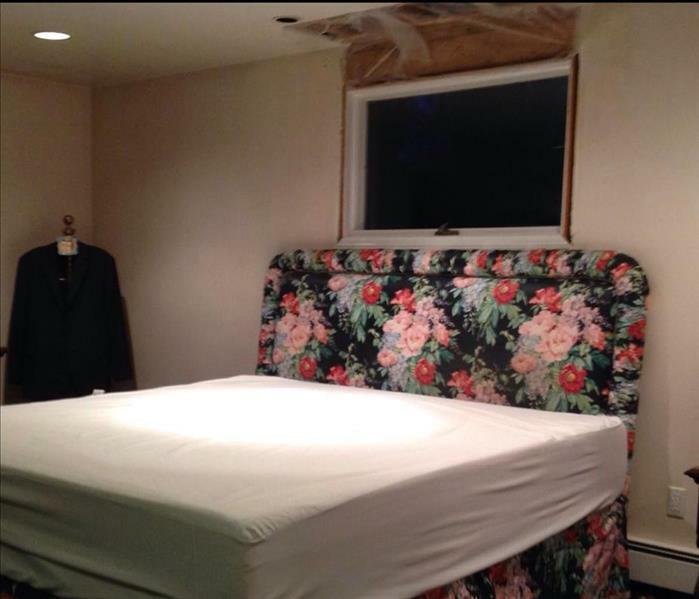 The room has now been cleaned and is ready for a contractor to come in and begin the work. This family’s home suffered serious damage after an ice storm. Thankfully they called SERVPRO of Tyler and we were able to help them and several other families clean up debris and restore the property prepared for a remodel. The homeowners were grateful that our 24/7 services were available to them in their time of need. If your home has been damaged by severe floods or storms, call us right away at 903-561-0168. Disaster can strike when we least expect it, but SERVPRO of Tyler will be there to help you weather the storm. Customer had lake home flood due to extensive rain. Due to the extensive rains, drainage ditches overflowed, streets became engulfed in water, and lake waters rose above the banks. SERVPRO of Tyler was called to help. 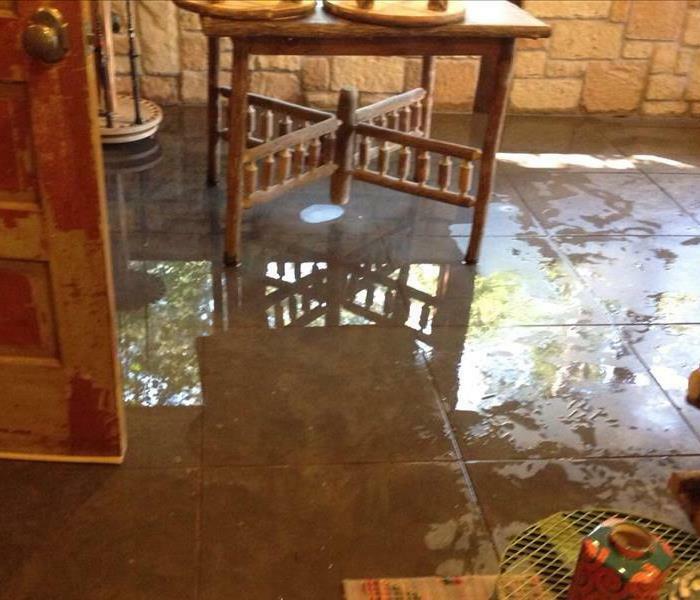 This family’s Mineola home suffered serious damage after a recent flash flood. Thankfully they called SERVPRO of Tyler and we were able to help them and several other Mineola families clean up debris and restore the property to preloss conditions. The homeowners were grateful that our 24/7 services were available to them in their time of need. This family’s home suffered serious damage after a frozen pipe burst. Thankfully they called SERVPRO of Tyler and we were able to help them and several other Tyler families clean up debris and restore the property prepared for a remodel. The homeowners were grateful that our 24/7 services were available to them in their time of need. A simple staff appreciation lunch turned into a fire cleanup. On a Friday afternoon teachers were excited for a relaxing lunch. One of the food warmers caught fire and caused damage through the business. SERVPRO of Tyler jumped into action to have the business up and running for work the following week. Freezing temperatures caused a pipe to freeze and burst. The pipe break resulted in flooding through out the commercial business. SERVPRO of Tyler sprung into action to make it "Like it never even happened." When you are faced with fire or water clean up and restoration needs call the pros at SERVPRO of Tyler. 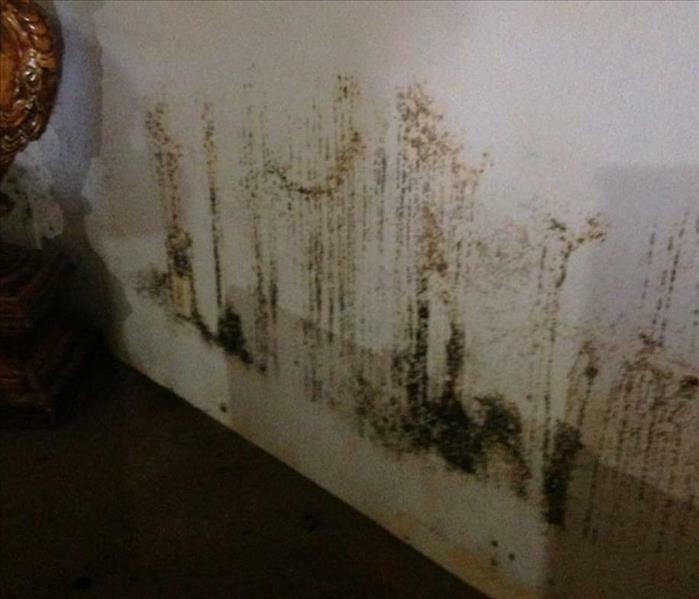 A water damage in a business that went unnoticed over a holiday weekend resulted in a mold damage. 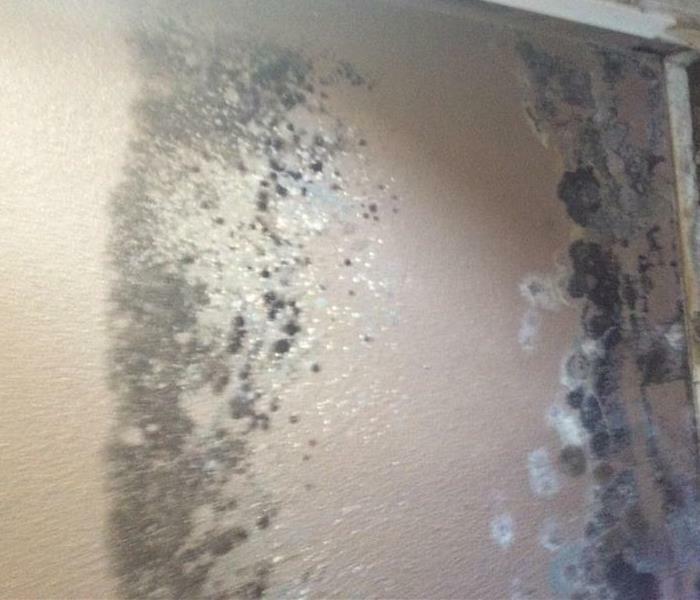 With the right conditions mold growth can start within 72 hours of a water damage. It is key to start the drying process as soon as possible to limit growth in a home or commercial business. If you have questions about water damage or mold call SERVPRO of Tyler at 903-561-0168. A toilet supply line burst creating several inches of standing water in this Lake Palestine business. 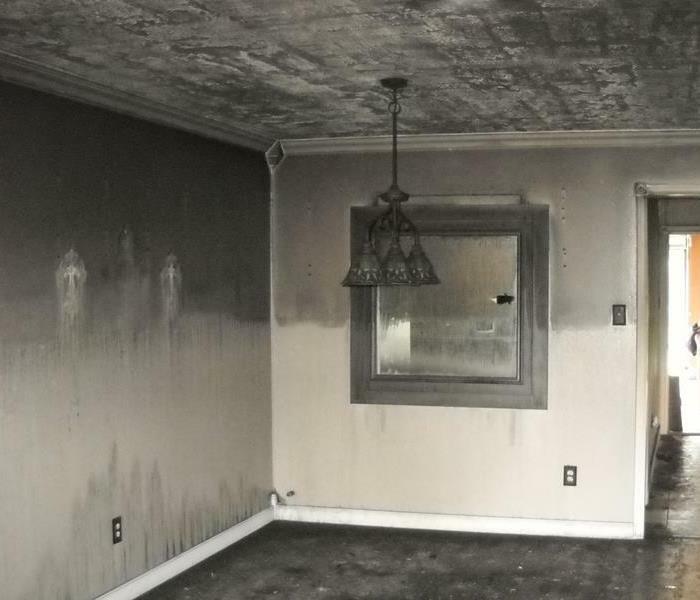 SERVPRO of Tyler worked around the clock to restore the affected area and prevent any secondary damage from occurring. 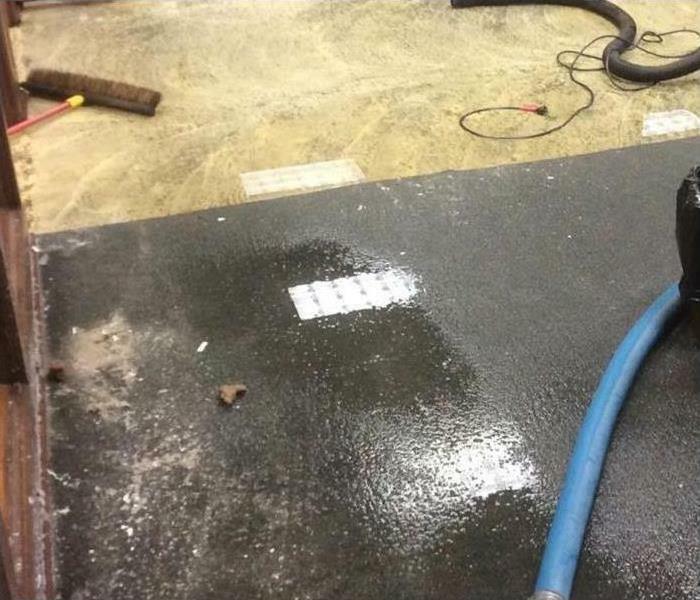 We know that commercial water damage can cost a business thousands of dollars in productivity; it is always our goal to help keep your business running as flawlessly as possible through the restoration process. 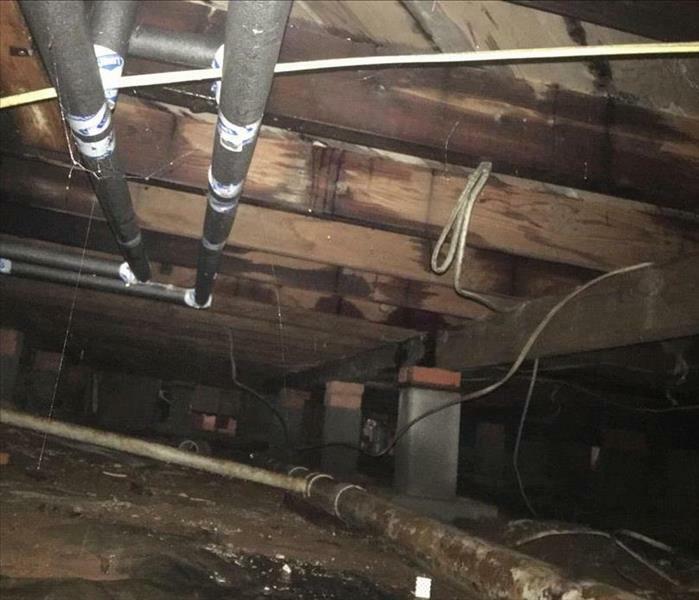 This family’s Athens residence experienced serious water damage after the water heater burst. SERVPRO of Tyler has the expertise and equipment to mitigate residential water losses just like this one. In this particular situation, we extracted the water then dried the carpet and walls in place. The family was very grateful to be able to use the space again within a matter of days! On a Saturday morning SERVPRO of Tyler received a call from a commercial contractor that was working on a major remodel project for a local bank. 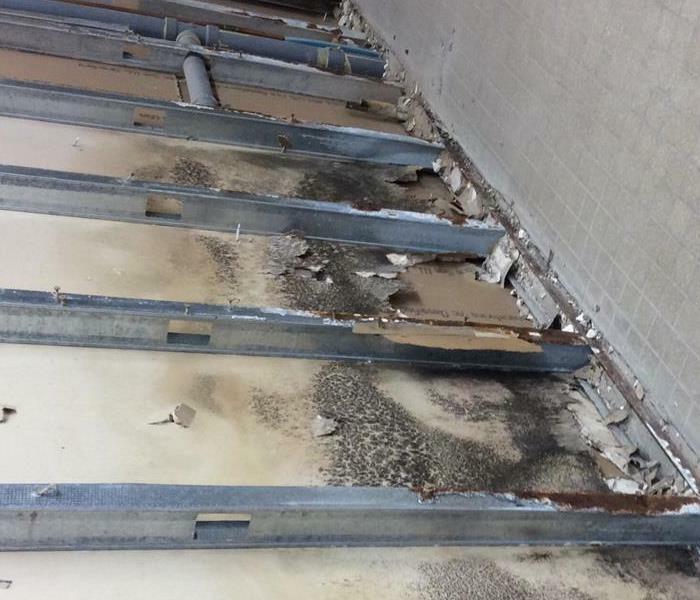 A subcontractor accidentally causes a major water damage that affected two floors of the building. The contractor need a restoration vendor that could handle the job and keep his project on schedule. SERVPRO was his first call. SERVPRO was able to dry the structure while other contractors could continue working. 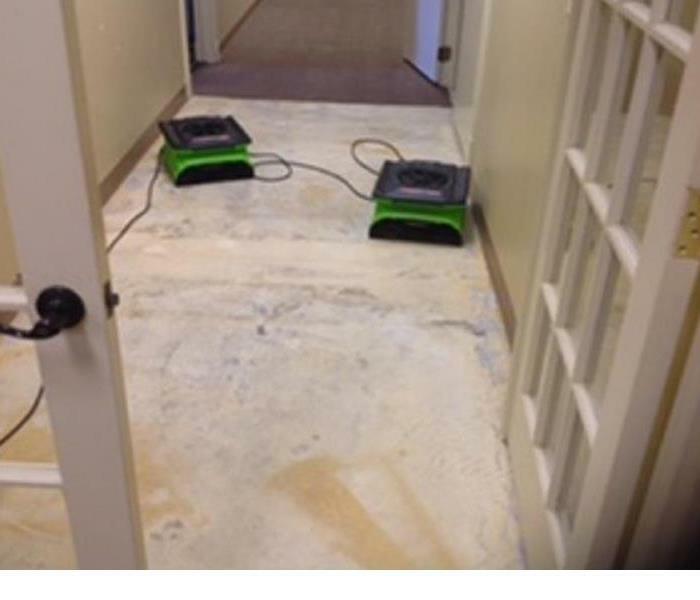 The commercial contractor was happy that SERVPRO could handle his large loss situation and keep his project on schedule. SERVPRO of Tyler is here to help. 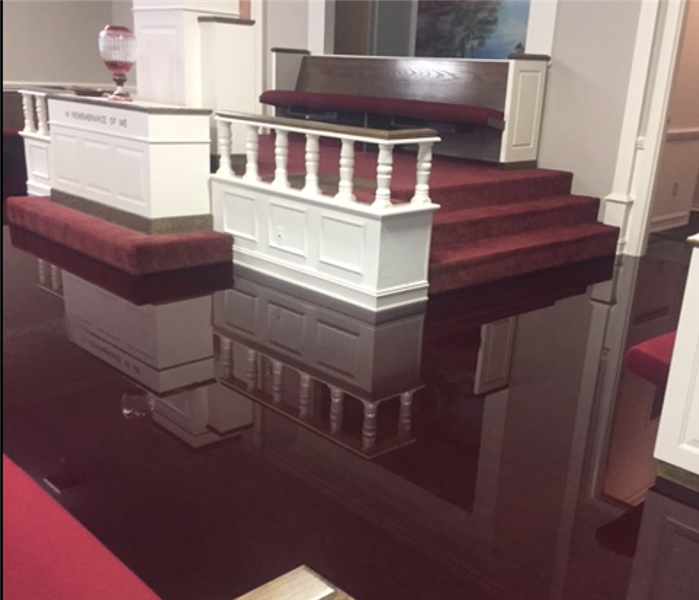 Three floors of a local church school flooded. SERVPRO of Tyler was ready and helped get the students back in class. 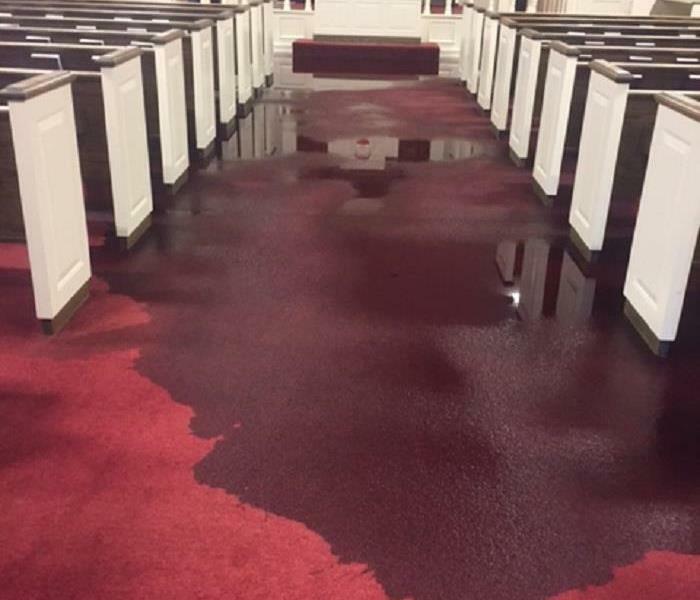 On an early Monday morning SERVPRO received a call from a local church. Three Floors of the community life center had flooded from a broken supply line. The Supply line was on the third floor and had run for 12 hours. SERVPRO was on the job site ready to help. Within a couple of hours the water was extracted and drying equipment was placed. The Church Community Life Center was back up and running for Wednesday night classes. SERVPRO is "ready for whatever happens". Commercial water damage from a water fountain supply line. SERVPRO of Tyler was ready to help. 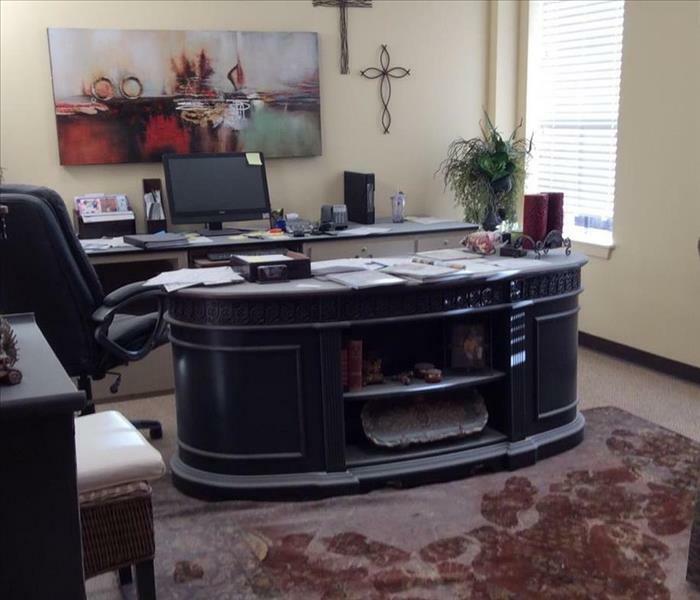 The business was able to stay open and functioning throughout the restoration process. In the banking industry there is no time to shut down a facility when disaster strikes. SERVPRO was able to help this bank stay open to the public while restoration of the structure was completed. There was no lost revenue from the doors being closed. All employees were able to work and customers could be services. The bank was back to normal a couple of days after the water fountain supply line caused the water damage. 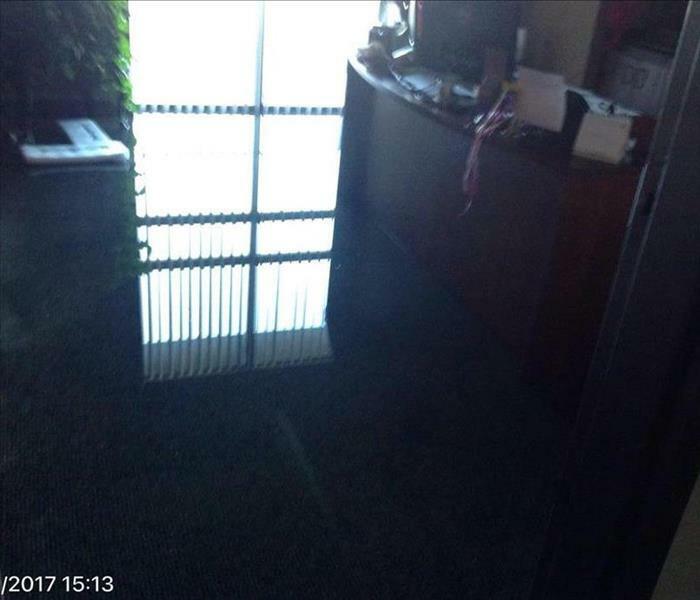 A commercial business center had 3 units flood on a Sunday morning. SERVPRO of Tyler was ready to help. The property manager and tenants were impressed with the response time, restoration and professionalism SERVPRO of Tyler. This was a business center with multiple tenants. Each tenant had different insurance policies that needed to be addressed. Each unit had a separate claim for contents. The building structure had a separate claim as well. 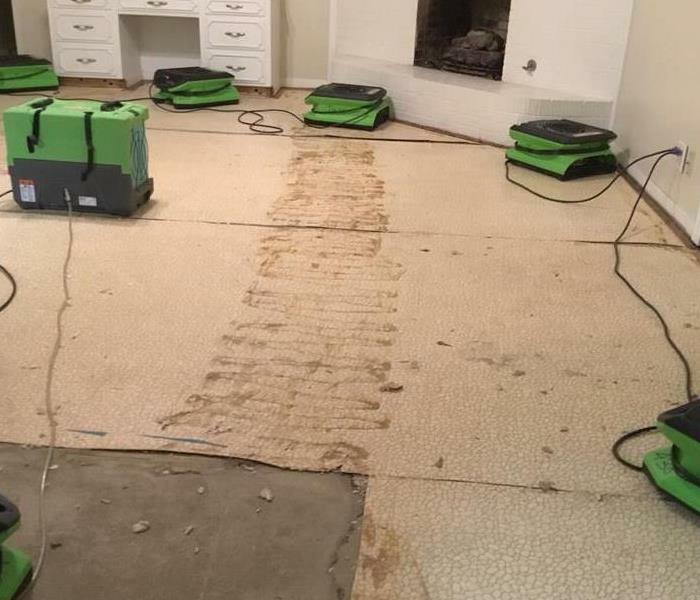 The customer was happy that SERVPRO of Tyler could effectively manage a large loss restoration project and the different insurances companies involved. SERVPRO is ready 24 hours a day to make it "like it never even happened". A commercial property had stone from the building facade collapse in Palestine, TX. The stone caused major damage to the building structure. SERVPRO of Tyler was able to come in and help. Crews removed the stone from the roof and surrounding areas. Then patched the roof until a structural engineer could clear the structure. Structural Engineers are utilized on many restoration projects. These engineers make sure a building a sound and can be restored. 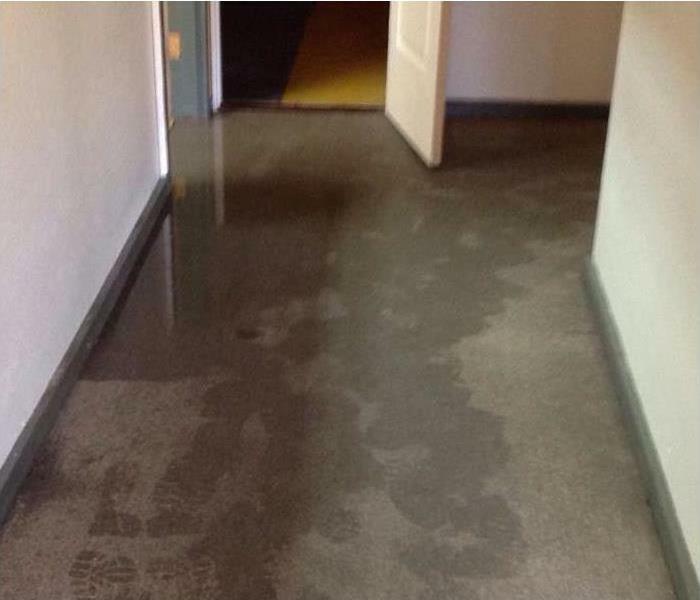 This customer has stained concrete flooring, and their kitchen supply line burst flooding their entire home. The customer does not reside in the vacation home. On a Sunday morning a neighbor noticed water coming from the garage. The neighbor knew they needed help fast. He knew the damage would be much worse if they did not have SERVPRO come out immediately. After extraction and drying the customer was happy their vacation home was a peaceful place to rest and not a disaster. The customer was thankful that SERVPRO of Tyler was able to come out on the weekend to help make their vacation home "like it never even happened". During a remodeling project on a commercial property mold growth was found in the wall cavities. The facility manager knew they had to address the growth before they moved forward. SERVPRO of Tyler was called to help. After proper remediation the project was ready to continue. The facility manager knew they had a previous roof leak but never imagined not having proper drying would cause so much mold growth. Learn more about mold remediation. This was the aftermath of a kitchen fire in Tyler. 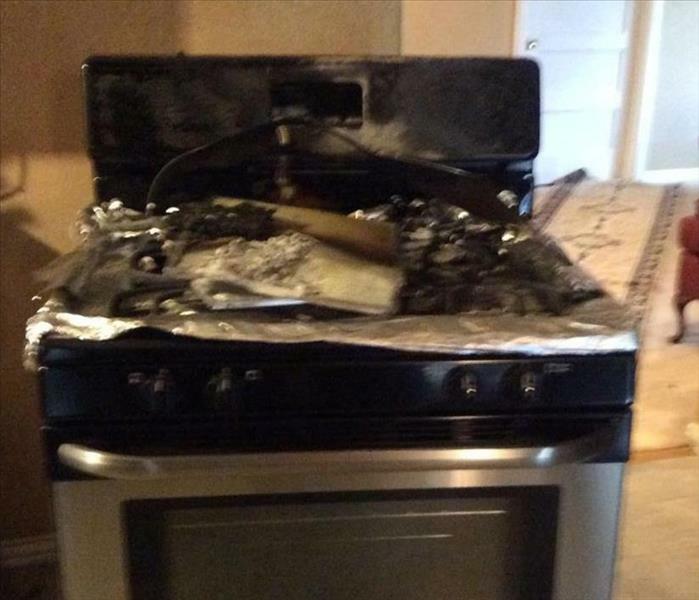 It's important to keep an eye on your stove when cooking. We were able to restore and clean the whole home that was affected by smoke damage and soot damage from this kitchen fire. SERVPRO of Tyler and SERVPRO of Athens/Mineola/Palestine serve the Tyler, Athens, Mineola, Palestine and Jacksonville Markets. We are the Fire, Water, Mold, and Cleaning Experts - available 24 hours a day 7 days a week for your emergency. We make disasters "Like it never even happened." SERVPRO of Tyler and SERVPRO of Athens/Mineola/Palestine are great sources for all of your upholstery cleaning needs. 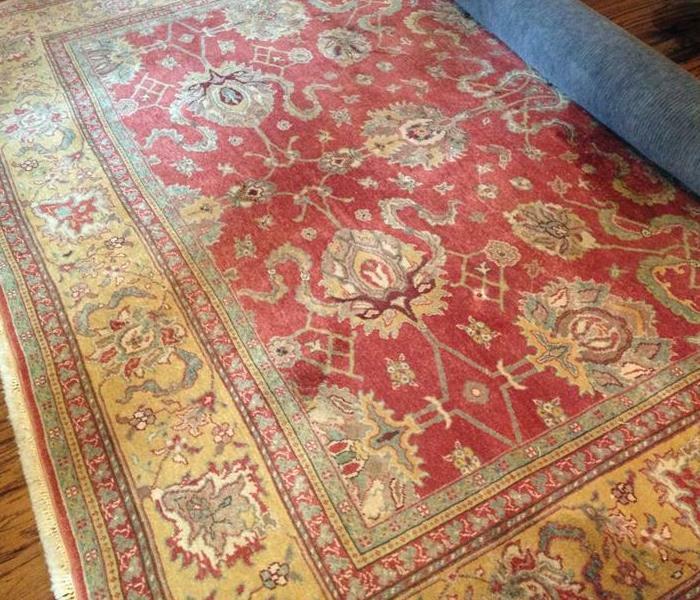 We are able to assist you with cleaning upholstery of all types including draperies, seat cushions, area rugs and oriental rugs. 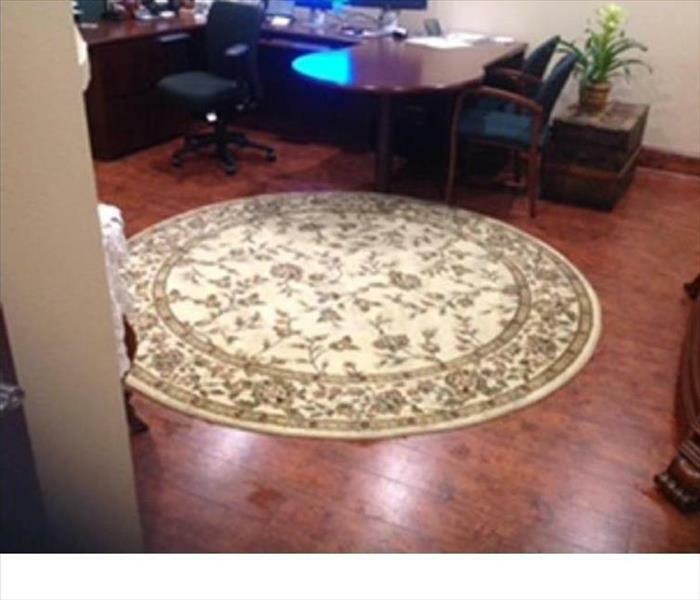 We can clean them onsite in your home or in our local service center in Bullard, TX. 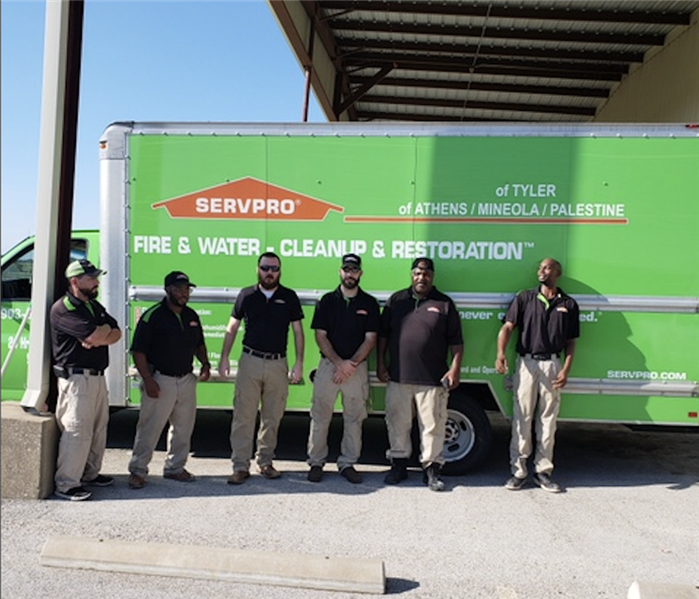 SERVPRO of Tyler and SERVPRO of Athens/Mineola/Palestine serve the Tyler, Athens, Mineola, Palestine and Jacksonville Markets. We are the Fire, Water, Mold, and Cleaning Experts - available 24 hours a day 7 days a week for your emergency. Our technicians are highly trained and experienced with every water damage situation from having wet carpets and wet padding to having 5 feet of water in your home. This loss occurred from a busted water heater. SERVPRO of Tyler and SERVPRO of Athens/Mineola/Palestine serve the Tyler, Athens, Mineola, Palestine and Jacksonville Markets. We are the Fire, Water, Mold, and Cleaning Experts - available 24 hours a day 7 days a week for your emergency. We make disasters "Like it never even happened." Recent flooding has caused water damage in many residential and commercial properties. If the damage is not properly dried there is a chance for mold growth. This customer had a water damage that is now a mold damage. If you see growth in your home or commercial property call SERVPRO of Tyler. Cooking is a leading cause of house fires. This customer forgot there was food boiling on the stove when they suddenly had to leave the house. There was smoke damage throughout the house. The customer was amazed that the soot was removed so quickly. When disaster strikes SERVPRO makes it "Like it never even happened."